Do you know what a Vaquita is? Probably not. Mexico’s little cow is not very well known. But they should be. They are critically endangered with fewer than 100 left in the wild, with some scientists believing there may be less than 50 left. Please, for the sake of the Vaquita, keep reading. Vaquita’s live in the Sea of Cortez off the coast of Mexico. It is also called the Gulf of California. They live a small area that is only about 40 square miles. Vaquitas are about 4’11” (1.5 m) long and weigh about 99-100 pounds. This little porpoise is the smallest cetacean. 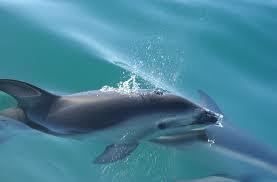 A cetacean is a group that includes dolphins, whales, and porpoises. They mate from April to May. Vaquitas are incredibly shy, which makes it hard to learn about them. They use sonar to communicate, and eat ocean fish and squid. They also have a very restricted habitat. Another endangered species in the Sea of Cortez is the Totoaba. The Totoaba is a small fish who is hunted illegally. Fishermen use gill nets to catch the Totoaba. Why? Totoaba swim bladders (which help the fish move up and down in the water) are prized for medical purposes in China. Vaquitas get trapped in the nearly invisible gill nets intended for the Totoaba. Vaquitas need to come up for air to breath, which is impossible when ensnared in the net, causing them to drown. Gill nets are banned in part of the Sea of Cortez, but they need to be banned everywhere. If not, Vaquitas could be extinct by 2018. You may feel sad for this shy little porpoise, and you may want to help. If you want to help, you’re probably wondering, How can I help this small animal if it’s all the way in Mexico? Here are some ways to help: The first way you can help is by donating to the World Wildlife Fund (WWF). WWF helps endangered species like the Vaquitas and the Totoaba. By donating to WWF, you can help them help endangered animals. If you’re thinking, But I’m broke! I don’t have any money to donate. That is where you find other ways to help. You can sign petitions against gill nets. Look up gill net petitions to sign on the internet. You can also boycott (to refuse to buy or use) Chinese shrimp because their capture also requires the gill net. Finally, observe July 9th, 2016 as “Save the Vaquita Day.” Biologists say more Vaquitas die each year than are born. It’s not too late, but it may be soon! Save the Vaquitas before they are gone forever.